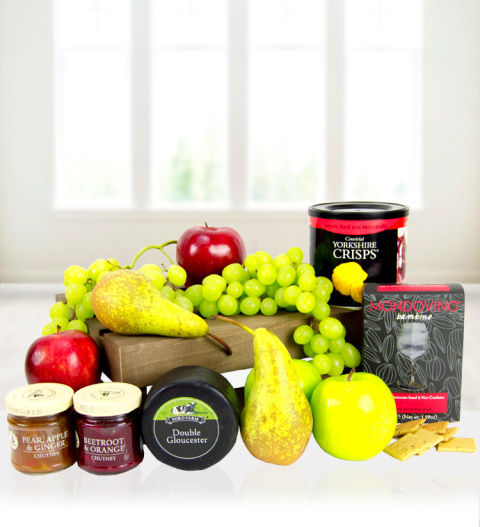 The Ploughman's Lunch fruit crate is packed with mouth-watering fresh fruit, delicious Gloucester Cheese, select pickles, hand cooked Yorkshire crisps and Mondovino crackers. Perfect for all occasions – this famers style meadow picnic is sure to delight any recipient. Included in this wondrous fruit crate are; X1 Waxed Double Gloucester Cheese X1 Pear, Apple and Ginger Chutney 100g X1 Beetroot and Orange Chutney 100g X1 Mondovino Crackers X1 Yorkshire Crisps Tomato, Mozzarella and Basis 50g Grapes 500g X2 Red Apples X2 Green Apples Conference Pears X2 Wooden Crate. The Ploughman's Lunch is available for UK next day delivery.